Plaque accumulates in the areas where the teeth meet the gums, causing inflammation. The earliest signs are bleeding while toothbrushing, and redness. However, no pain is felt. The next stage is swelling of the gum. This is called Ginigivitis. Gradually the gum becomes detached from the enamel exposing the root and causing a pocket, which fills with plaque. Eventually the pocket becomes deeper until inflammation reaches the bone, which is then slowly destroyed. The bone can then be destroyed to such an extent that the tooth becomes loose and may even fall out. 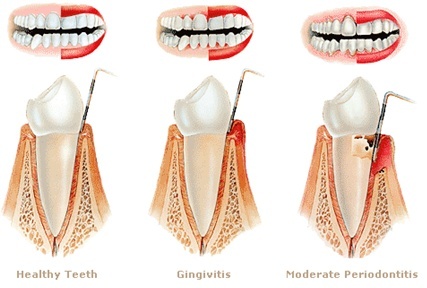 This is called Periodontitis. Visiting your dentist or hygienist for advice on brushing and flossing techniques and the use of special brushes, together with regular cleaning and dental appointments will help to keep your gums healthy. Maintaining good oral hygiene helps to prevent gum conditions from worsening. Sometimes basic treatment is not successful at getting the gum disease under control. This is because the pockets in severe periodontitis are so deep it is not possible to fully clean the roots by this method. The dentist may then suggest further treatment to encourage the gums to heal around the teeth .This will be carried out over a number of visits until we can be sure the gum condition is stabilising and returning to health. Gum re-shaping is sometimes required to improve the aesthetics of teeth in conjunction with restorative treatment.